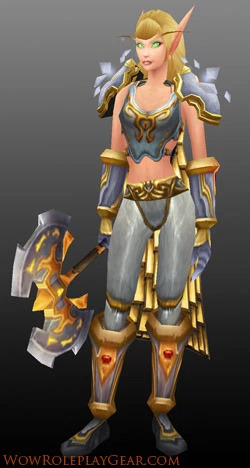 We’ve compiled three outfits for this article, all of which are based on the Truesilver Breastplate. The first outfit focuses on the blacksmith-crafted Truesilver items, the second utilises items from the incomplete recolour of Paladin Tier 5, and the third displays the matching pieces for the Cloudkeeper Legplates. Note that the second and third sets only list the items which differ from the first set. ~ by Noelani on December 19, 2012. The Twinblade of the Phoenix would be nice here as well. I got the legs off the AH and built around it. Assessa – Sargeras. I used the scimitar from Elegon and Zom’s Crackling Bulwark for weapon / shield. I was able to find a blacksmith with all the patterns for the set but still need to get some different shoulders as Pauldrons of Edward the Odd don’t really mix well. IMO those are the most rockin weapon shield combo. Anyone know any staffs for this set? Key to the planes looks like it matches well. But I would have to go with the one that drops in Scarlet Monastery off the last boss. Well….I found out this recipe via 5.2 was removed from an oldschool blacksmiths list….he said he had it but now it’s gone can you verify this for me? Is it actually gone is my question. It still appears in my crafting log, and that of several of my guild mates. No problem, your language was fine, and we’re not from the US either anyway! It was indeed really difficult to find a good shield for this set. The best suggestion I can come up with at this time is Khan’s Buckler/Hyperion Shield. The model might not be to everyone’s taste, but the colours are a great match. 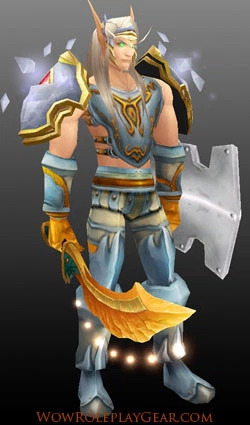 As of 4.0, the plans for Truesilver Breastplate are no longer obtainable…so pray to the gods that someone on your server knows it already.